Text and photos except where noted © Eddy Edwards 2010-13. Please do not use my material without permission. Each section of this page shows in tabular form brief details of the features and structures of the Washes including those described on the History & Management page operation section. The tables also act as an addtional site index with links to detailed pages and photos of each item. There are hundred of photos on the site, old and new, and some slideshows too, which, apart from the sampler below, can run automatically or be completely manually controlled. If this message remains displayed, your computer's settings need attention or you may need to "allow blocked content". 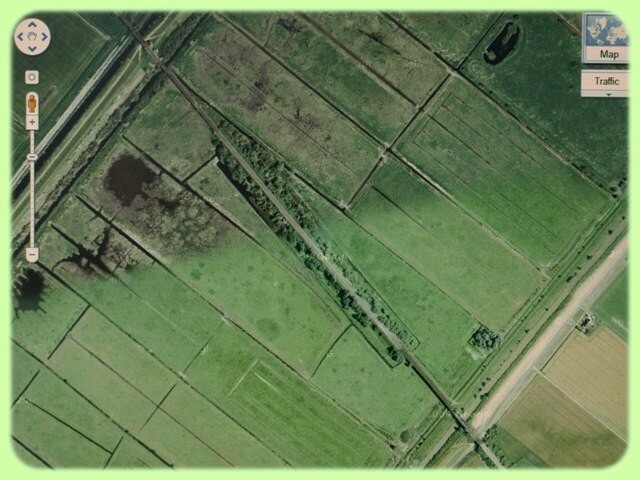 Those in the first two tables below are the "high-level" man-made watercourses which run above the surrounding land through raised embankments. They are known as "main rivers" and are managed by large organisations - since 1996 by the Environment Agency (EA) - responsible for discharging the waters into the sea. 1 The names of the rivers can be very confusing, not just by being named by width as explained above. The order of alternatives shown above does not necessarily indicate the correct or most commonly used ones. 2 The OBR was dammed c1652 at what became known as Welches Dam. The southern section was abandoned; the Forty Foot River was joined via a lock to the northern section which continued to Salters Lode. The two parts of the Old Bedford later became two completely separate river systems (see below) compounding the confusion. 1 This river system combines the Cranbrook Drain from the "highlands" around Colne and Somersham to Black Sluice (BS) just north of Earith where it joins the start ('head') of the Counter Drain (CD), which runs to the west of and parallel to the Old Bedford River (OBR) to Welches Dam (WD) where it is joined to the northern section of the original OBR. 2 This river system combines the southern section of the original OBR from Earith Sluice to WD where it is joined to a newer cut, the River Delph, dug c1750 (or 1772?) from WD to the NBR at Welmore Lake. 4 The year 1772 is quoted by N. James in "Drowned and Drained" a Cambridge University publication in 2009, but no source attributed. The three 'main rivers' listed above are "embanked", that is they have raised banks on one or both sides. Two banks, known as 'Barrier Banks', are particularly important because they stop floodwater flowing onto the vast low-lying areas known as 'levels' each side of the Washes. On the west, the Middle Level Barrier Bank (MLBB) is the west bank of the Old Bedford/Delph River (OB/DR) which runs 30km/18.6 miles from Earith to Welmore lake. On the east of the Washes, the east bank of the New Bedford (or Hundred Foot) River (NBR) is the South Level Barrier Bank (SLBB) which runs from Earith to Denver Sluice. The east bank of the OB/DR is very low allowing excess fluvial floodwater (ie freshwater from upstream) to flow over it into the washes (see below). This floodwater can flow right across to the 'Cradge' bank, the west bank of the NBR. This bank was a later addition (1820s?) following petitions to stop high tides over flowing into the washes taking saline water and silt. During exceptional flooding (fluvial, tidal, or both) water can overtop the cradge bank from either or both sides forming a virtual 'inland sea' stretching from one barrier bank to the other. In the 1750s when the third channel, the Delph, was cut the MLBB was changed from being on the west of the original OBR to the west and north of the new cut, crossing the Washes to the sluice into the NBR at Welmore Lake as it does today. Thus the southern section, Earith to Welches dam, dates back to 1637 whereas the northern section from Welches dam to Welmore Lake from the 1750s The new MLBB may have built (at least partly) with clay from Gault pits near Sutton, possibly trasported by barges or lighters accross the washes through a canal known as Great Dyke. The west bank of the OBR was allowed to shrink and is now called the 'Low bank. Following exceptionally high tides in 1937 and 1939 which prevented the washes being drained through Welmore Lake, the MLBB was "raised 2ft 6ins (0.76m) and breasted with clay for the greater part of its length" according to the Allen Engineering Review, Feb 1949). The OBR low bank wasn't touched. In the mid 1990s there was a huge scheme by the National Rivers Authority (NRA) to raise and strengthen both barrier banks. Crests were widened to provide a 3m/10ft width for inspection and maintenance vehicles, and a haul road built at the toes. 1992 estimated costs were £13m for MLBB and £8.5m for SLBB. Works completed c1996, the year management transferred to the Environment Agency (EA). Prior to the works numerous boreholes were made along both banks to examine the old materials. The data was analysed in 1990-93 by Dr N. James and compared with earlier ones and historical reports. Summarising his findings he said there was evidence (turf lines) of three main and two sub phases of construction and in general they confirmed the expectations that initially most banks were 'local peat'. However some clay was found at the base in some places, particular at the north and south ends. Later, silt, then silt and clay, were placed on top. Unfortunately the extra weight added spread the bank bases and lowered the crest levels. In 2004-5, to counter erosion by wave action, 17km/10.5miles of the MLBB had extensive concrete revetting laid on geotextile fabric membrane added to the front (Washes side) by EA's workforce, cost £2.5m. More works were caried out in 2011 (using 8,000m2 of 4.1m x 2.4m panels) and a further 1.8km / 1.1miles was laid in 2012 by EA operatives at a cost of £1.1m. The latest works began in July 2017 and I will report on that later. Vermuyden described the area he created between the barrier banks in the 1650s as a 'receptacle' for the water 'to bed on in times of extremity'. In other words, a temporary floodwater storage area. Other names used over the 3½ centuries since include washes, washlands, and floodplain (all admirable, signifying the variable land use) and wetlands or reservoir (both suggesting a single use). The latter is favoured by the EA and other professional bodies. "These wetlands...are between the Old... and New Bedford .... adjacent to and on the outer edge of those rivers are the Barrier Banks which form the rims of the water retaining area known as the Ouse Washes." In 1995 they published a nice schematic plan entitled "The Ouse Washes and Barrier Banks". Unfortunately my copy is too tattered to show here but it is exactly the same as below left apart from the title. In 1996 NRA was replaced by a new organisation, the Environment Agency (EA). The following year, 1997, the EA were appointed the "enforcement authority" for large reservoirs (capacity +25k m3) covered by the Reservoir Act 1975, and the Washes floodplain was formally registered under the act as a "Flood Storage Reservoir" (FSR). 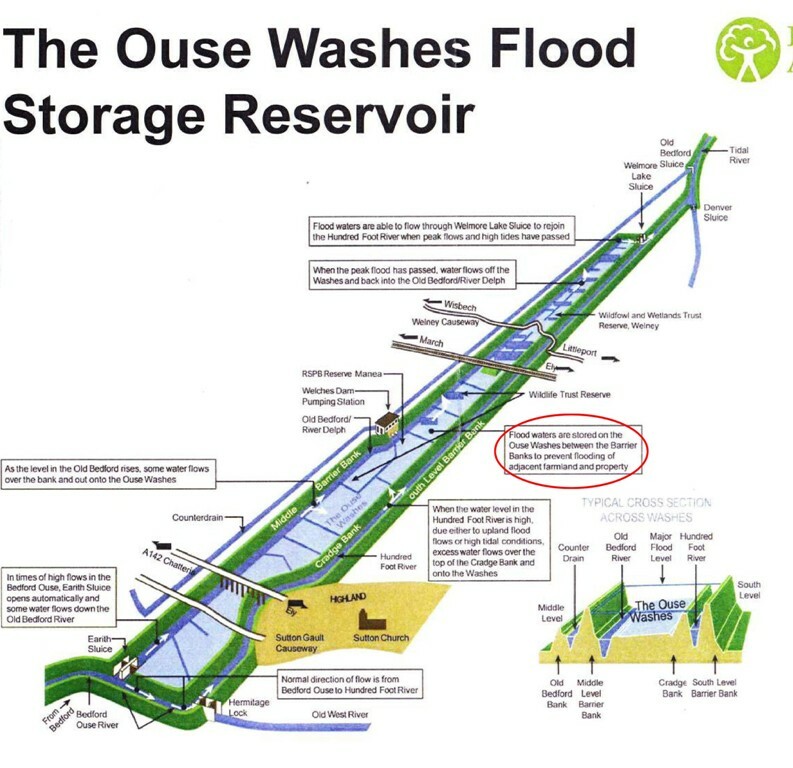 "Flood waters are stored on the Ouse Washes between the Barrier Banks". The EA's current Water Level Management Plan (WLMP) of 2002 describes the Washes status as a reservoir in para 3.2.6 stating that the Act's regulations principally relate to the floodbanks which form the reservoir - MLBB and SLBB. 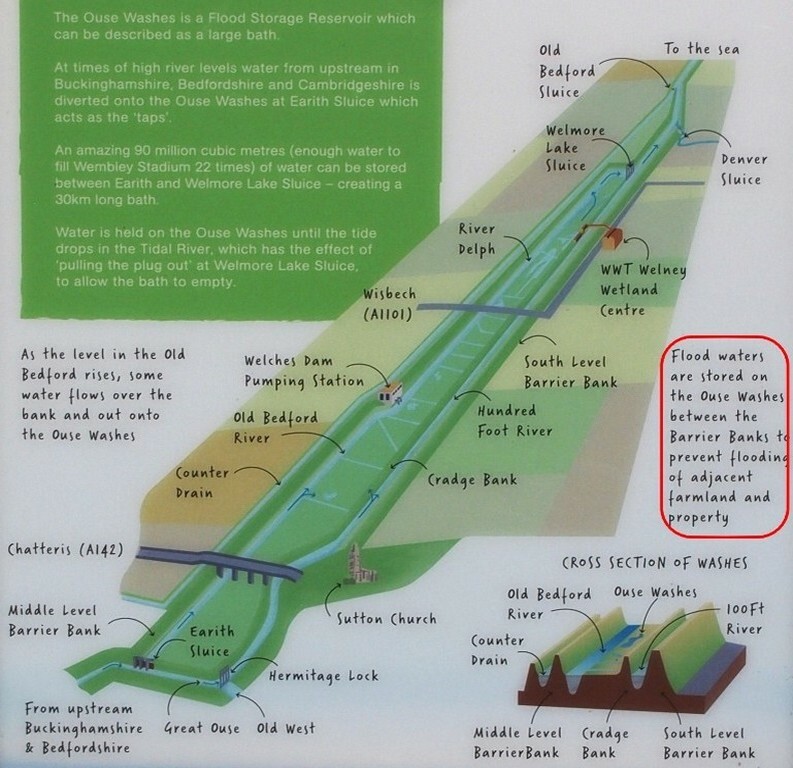 It was therefore a surprise to many attending EA drop-in events in 2016 and 2017 about current major bank works (see below) to learn that the EA now say the sides of the washes are designated reservoir 'dams' and are no longer the two barrier banks, but the MLBB and the Cradge Bank (which incidentally was not part of Vermuyden's scheme, being built in the 1750s-1820s by when some incoming high tides could flow out into the Washes). Reservoir banks have to be inspected twice-yearly by an engineer from a panel of experts, usually employees of consultancy or civil engineering companies (e.g. Mott MacDonald), in accordance with Section 10 of the 1975 act. Thus any recommendations for remedial action - "Matters in the Interests of Safety" (MIOS) to use the jargon - are known as 'Section 10 Works'. The latest "Section 10 works" began in July 2017. (Cost £10m; design: Mott MacDonald; main contractor: Jackson; ground engineering and haulage: Mick George.) An odd thing is the work is on the MLBB - and the SLBB, which is not subject to section 10, but NOT the Cradge Bank which is. Part of the Great Ouse Flood Protection Scheme, this 11 mile (18km) long cut from Denver to Kings Lynn has a very important part to play in temporary floodwater storage. For details, please see section on: my Denver Sluice page. The first two are from books in my personal library. The second is south of Welney, and I assume the first is too. Both have good points but neither is entirely accurate. Together, they provide a good guide to the relative position and levels of the rivers, banks and washes. The first is c1980. It is clear and informative. I don't know the data source but think the heights are probably "design" rather than actual. They are shown as "SLD" - South Level Datum - rather than AOD. (0mAOD = 100mSLD.) This is used in South and Middle Level areas, much of which are below sea level (ordnance datum), to avoid negative values (which are not always obvious - see note 1 below). There are quite a few gauge boards in or near the washes marked this way. It also shows widths which are useful but note the wash is a little wider elsewhere and only half that shown near Sutton. Next is 1997. It shows heights following major bank works 1992-94 bringing them back to (or near) design height after years of "settling" down. The horizontal dash line marks zero AOD. The earlier plan correctly shows the "crests" (bank tops) are flat not pointed as in the later one. Since 1994 crests are at least 3m (10ft) wide providing a roadway for light vehicles used during inspections and maintenance. 1. The edge of the Middle Level. Land height varies but is nearly all below sea level. The negative value on the lower diagram is not very obvious. 2. The 'low bank' was the Middle Level Barrier Bank (MLBB) for a hundred years or so until the River Delph was cut (marked Old Bedford/Delph.) It now runs outside the Washes from WD to Salters Lode. Considerably lower in 1997 than earlier. 3. The Counterdrain/Old Bedford River. The 1980s drawing shows the bottom much higher than in the 1997 one. I believe the later one is correct but have no data to back that up. 4. The MLBB since the 1750s. 7. The 'header' dyke ("Cradge Bank ditch") Not shown on the top diagram. During the summer this dyke is fed from the NBR and distributes water for irrigation. 9. The New Bedford or Hundred Foot River. Normal flows are within the "V"; very high tides can rise onto the flat banks each side shown on the lower plan; extreme high tides can "over-top" the Cradge Bank and flow onto the Washes so preventing the river flowing over the outer bank and inundating (potentially) thousands of acres of low fen lands in the South Level. 10. The South Level Barrier Bank. The diagrams above are not wonderful, but nevertheless far superior to the dreadful one below found on the ousewashes.org.uk website. It was "created by Sheils Flynn for OWLP". If I were the OWLP I would demand my money back . It's horrible. 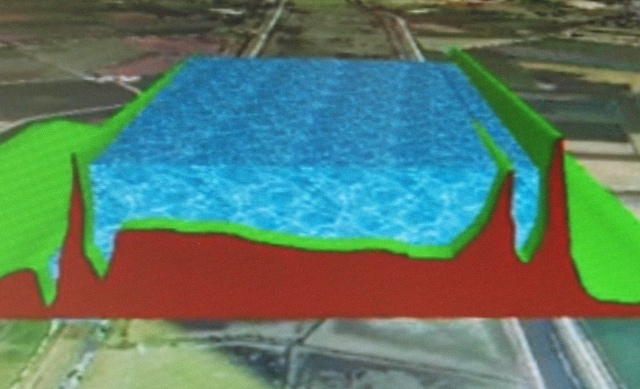 Counterdrain shown dry; CD/OBR low bank omitted; 'embankments' not named; cradge ditch omitted; large dry drain on right doesn't exist; no level/height values shown; right edge of Washes shown in mid-air. OWLP was a 4-year £1m lottery-funded scheme with a full time manager with staff and large back up and this is the best they could do. Pathetic. In Feb 2013 some videos uploaded to YouTube by "GreenVenturesTV" used incredible imagery to try to demonstrate the workings of the Washes. Technically brilliant in some ways but which may be misleading in some respects such as the still frames shown here. Image on right from the video shows the fall across the washes sloping down to the right, i.e. eastwards, and the western river, the Counterdrain/Old Bedford, lower than the Old Bedford/Delph next to it. The diagram on left from an EA brochure (EA OB LEAP, 1997) shows the generally accepted "norm" with the washes draining to the left i.e. westwards, into the Old Bedford/ Delph River. The western river, the Counterdrain/Old Bedford, is shown here higher than the old Bedford/Delph, as it is on both diagrams in the previous section of this page. "I do have to wonder what the LIDAR data source is. Is there any chance the profile from the video is actually correct and demonstrates why there are problems getting water off? I presume env agency data from their report comes from ground level surveys"
Well maybe Graham has a point; there are a few washes which remain wet (eg one just south of Sutton Gault) but the general lay of the land (90%?) is to the west, draining into the Delph. The system wouldn't work otherwise. Explanations should show the norm not the exception. What cannot surely be defended is the image on the left from the video, showing grossly inaccurate levels of the NBR and its banks; and wrongly marking the Middle Level Barrier Bank. The only notable features in the washes (as opposed to around them) are the earthworks near Earith called the Bulwarks; the embankments and viaducts of the railway line; the road viaduct and a small group of houses at Mepal; the road causeways at Earith, Sutton and Welney; some cattle pens dotted around; and the WWT observatory north of Welney. Also, throughout, a surprising number of trees. When in flood, the waters in the washes flow downstream from south-west to north-east. But there is an extra dimension - the wash lands are generally higher on the east, so when not in flood, the field drains take waters north-westwards across the washes towards the Old Bedford/Delph (OB/D) river. The gradient is natural, and gentle, a fall of 12 to 18 inches (0.3 to 0.45M). This sideways flow has to be controlled and not allowed to simply drain into the OB/D because the internal ditches need to be kept filled during summer as explained elsewhere. The cross-section diagram in the section above is north of Welches Dam (WD) about halfway between the railway and the A1101, with levels expressed in metres "AOD" - above ordnance datum, i.e. above "sea level". For an explanation of the river names see above. It is often difficult to understand the early operation of water control structures when reading past accounts due to terminology. Sasse and sluice seem to be used by different writers to describe the same feature, neither indicating (to me) whether navigation was possible. When navigation is mentioned, it is unclear whether that was only when water levels each side were virtually the same enabling a gate to be lifted or a single set of mitre (vee) gates or doors to be opened, or whether the structure was a true lock with 2 sets of gates allowing passage at any time regardless of differences in levels. The dates show when structures were erected or dams formed at a location, but should not be taken to be the date when the current type of control was introduced. Use the links in the left column to visit pages with gretater detail and photos. Old Bedford Sluice is operated for navigation purposes only by the MLC lock-keeper at Salters Lode on behalf of the EA, otherwise operated by the EA staff at Denver. Black Sluice 0.8m nth of Earith. TL 3971 7595 P 0.60m Manual. 3 G-V -1.4m 7.3m Lift Gates set daily by visiting Denver staff. Main source: EA OW WLMPs, 1996, 1998, 2002. 1 Lock dimensiions in italics from Jim Shead's canals website; all others from EA WLMP & GOR map. 2 G = "Guillotine" vertical lift gate; V = "Vee" mitred gates/doors; R= Radial gate; F=Flap gate; P=Penstock; D=Dam boards. Two letters indicate a set of gates/doors, 1st is upstream, 2nd downstream; Digits indicate number of sluice openings. 4 Disused but appears generally sound. ML Act 1848 authorised/required MLDC to build a pen sluice to keep water from Old Bedford out of the ML,subject to navigation rights. 8 The Great Ouse Tidal River Strategy (GOTRS) in 2009 recommended raising winter drawmark to 3.77 which would mean less water stored so quicker draining, and increase flow on NBR to help manage siltation. 9 Normally raised allowing navigation but closes without warning when Welches Dam PS is about to operate, both events automatically triggered when river level at WD reaches a pre-determined figure. This section has moved to a new page. Middle Level Transfer Welches Dam OBR to ML 4704 8581 EA (MLC?). Old Mill Drove ML to CD/OBR 4721 8619 1920s? D? Manea & Welney DDC? 5 Note reduction in output on conversion to electric. I understand this was due to maximum overhead supply being limited to 1000kva. It was considered un-economic to upgrade supply to provide sufficient power for more or larger pumps. Source: NRA OW WLMP, March 1996; EA OW WLMP, 2002, Fig 6 for HFW IDB refs. TF 5860 0159 road bridge at sluice WC brick arch 1828? 2 Gardner's 1851 History of Cambridgeshire & Isle of Ely, pages 565-6. 5 a pin-connected truss bridge similar to a UK military bridge. Where there was a ferry service, there was nearly always a pub on both sides where passengers could shelter whilst waiting or warm up on arrival. See next section. What have pubs to do with the history and operation of the washes? Quite a lot; where else could all those engaged in digging the cuts and building the sluices live, or spend their wages and enjoy some leisure? And who better to provide them than the land owner and employer. "house travellers and labourers employed in the vicinity; the latter particularly in times of flood, are there supplied with food and shelter, during their daily and nightly exertions in the protection of property." The pubs were leased every six years, by auction. The BLC accounts for 1830 shows the annual rents for the 20 totalled £696 (p635), and expenditure to "build and repair" of £277-8s-8d (p643). Four of these were some distance from the banks of the Washes, and excluded from the list below. Other bank-side pubs that were either built after 1830 (co-incidentally the year the Government introduced the Beer Act) or were not BLC ones, are included. Jolly Waterman Salters Lode WC later moved to lock-keepers hse ? Recording the houses along the river banks of the Ouse Washes is going to be a long job, and I will not be tackling it seriously until the main project is finished. However for various reasons I have recorded a few of the more interesting ones and these are listed below. In 1964 the RSPB made their first acquisition in The Ouse Washes, buying some land south of Welney, and in 1965 more land was bought by what became the Cambridgeshire Wildlife Trust. Also in 1965 the Wildfowl & Wetlands Trust (WWT) bought some land north of Welney. Acquisitions by all three continued over the next 35 years, and by 2000 they owned between them about 75% of The Washes as detailed on the introduction page ownership section. Their conservation and wildlife activities are described on their own sites; here I will simply be recording the buildings they have erected - their visitor centres, bridges, hides, stock buildings and workshops. 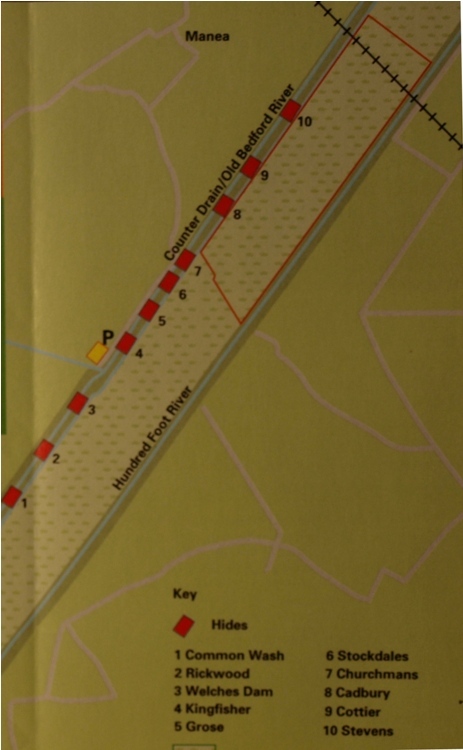 On the left is the layout of part of the RSPB reserve showing the 10 hides. P marks the car park next to the Visitor Centre - a very simple shed - the emphasis here is on seeing the birds and other wildlife. There are no charges for use of the centre, car park or hides, and nowhere to spend any money. Bring your own food & drink, there is a free picnic area. 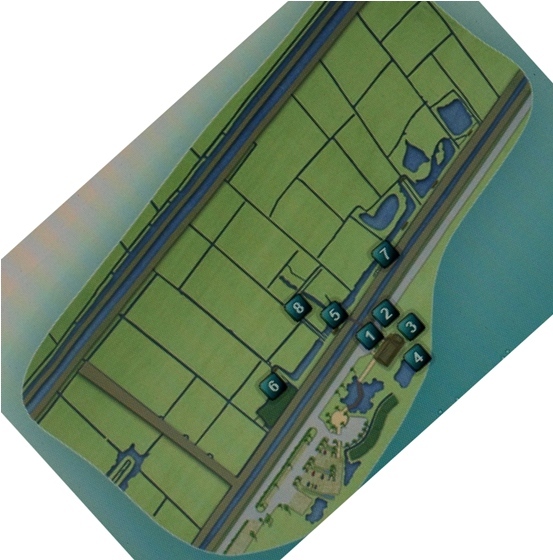 On the right is the plan of the WWT reserve. There, parking and entry to the Visitor Centre is free, but there is a charge for entry to the observatory and reserve, and the shop & restaurant are also happy to take your money. Nos 1-2 are the visitor centre and Widgeon restaurant. see also New Habitats (below) and Conservation on my History & Management page. In recent years more frequent flooding of the Ouse Washes in spring and early summer and longer and deeper flooding in winter has resulted in a deterioration in the habitat suitable for certain wildfowl and a subsequent decline in their numbers. The Environment Agency (EA) concluded that it would be too expensive to improve the Washes and a better option would be to create new wetland areas nearby. In 2006 the EA bought 38 hectares (94 acres) of farmland alongside the WWT's visitor centre on the Hundred Foot Bank, on the east of the Washes. The EA said it was to compensate for flood defence work carried out on the Middle Level (ML) Barrier Bank. Apart from the fact that the ML barrier bank is on the western side of the washes, I don't understand how raising & /or strengthening river banks affects wildfowl. Anyhow, work began on site in 2008 by digging ditches, channels and scrapes, laying a waterproof liner, seeding with native grasses and providing controls for water depth. The new wetland now provides ideal winter accomodation specifcally for wigeon (500 in the first year), but it has also attracted other species and may also help black-tailed godwits which have suffered badly from summer floods washing away their eggs and chicks. "The objective of the project is to create at least 500 hectares (1,200 acres) of new wet grassland habitat to restore the populations of black-tailed godwit, snipe and ruff during the breeding season as well as wintering wigeon. The new habitat has to be close to the existing Ouse Washes with suitable soils and sufficient supply of water to create the optimum conditions for nesting and feeding birds. 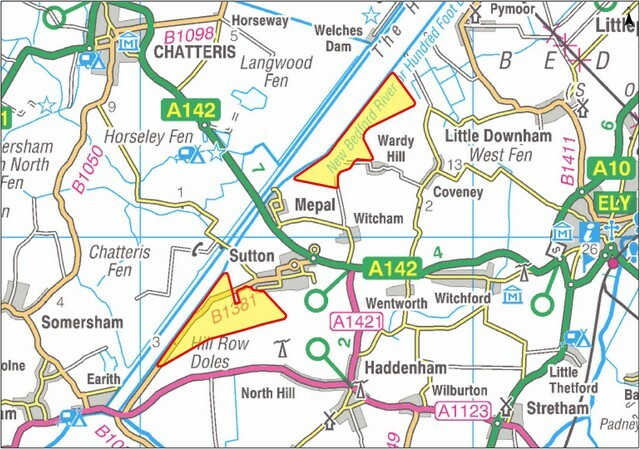 We have identified two sites close to the villages of Coveney and Sutton, Cambridgeshire, that meet the habitat requirements. Over the last few years we have been working with local landowners to agree land for the project. The map (below) shows the location of the two sites and the approximate extent of the area we hope to create as new habitat. Government has asked us to deliver the project on its behalf and is providing funding through an annual allocation to progress this work." See local MP's concerns regarding this plan. see also Nature Reserves (above) and Conservation on my History & Management page.